One of the things that struck me during the last election is the fact that many District residents are not aware of the smallest unit of government in town: the Advisory Neighborhood Commission, also known as ANC. The ANC is a volunteer position, filled by a corps of neighbor volunteers. 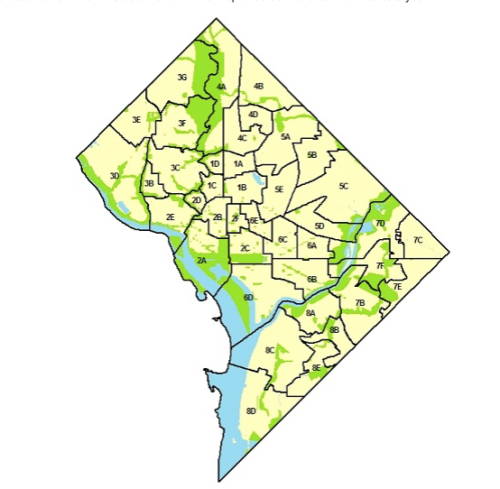 Every ward in the District is divided into several Advisory Neighborhood Commissions; these are further divided into Single Member Districts. ANCs oversee and, as the name indicates, advise the District of Columbia government on all manner of topics, from parking to construction to permits and everything in between. You can find more information about ANCs at their official site by clicking here. Regional blog Greater Greater Washington compiles the most comprehensive ANC voter guide anywhere, taking the time to send incumbents and candidates a questionnaire, and sharing those responses, along with their endorsements. Since GGW is an infrastructure and transportation blog, the focus is highly concentrated on those issues; however, their coverage is unrivaled. While here at The Hill is Home we are a far more modest and small-scale operation, we want to give you a chance to get to know your own Advisory Neighborhood Commissioner– specifically, your Single Member District commissioner. I recently sent commissioners in Ward 6 (6A-6D), as well as the commissioners in the adjacent areas to the Hill (ANC 5D and 7 a short questionnaire. I hope their replies will help you, as a reader and a Capitol Hill neighbor, to get more familiarized with the area, the boundaries, and the issues in your own microcosm. We will publish the replies grouped by ANC: You will see all the commissioners’ answers in 6A, then 6B through D, then our neighbors in 5D and 7D directly to the north and northeast of the Capitol Hill community. Don’t see your SMD? We will be updating these replies as our commissioners take time out of their schedules to reply to our short questionnaire.